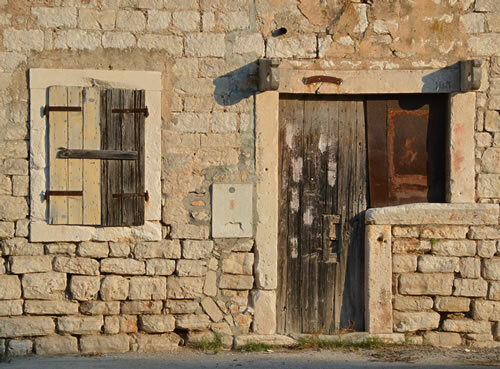 The word for a door in Croatian is vrata, which comes from the old Slavic word vorta. It’s always plural, in the same way that trousers or pants are in English. And vrata means both the opening, and the object we use to close it up. Now that may be a wooden door, glass door or wrought-iron gate, inside or outside, in the house or garden or field – vrata covers all types. Around the island, there are a fascinating variety of vrata. 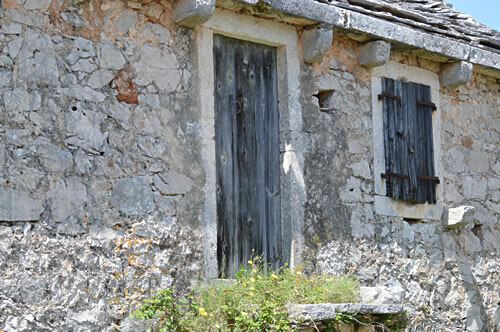 The doors on farmhouses are simply slats of wood, same as the shutters. 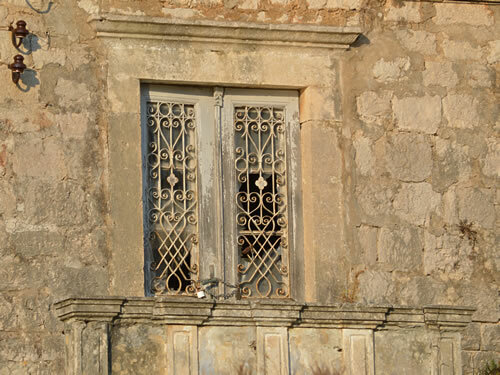 The rustic, weathered example above is the front door of a house, which is up a flight of stone steps from the courtyard. But not all the houses in Humac are fading away – the updated version of the old classic door looks smart and welcoming! I really like the natural wood varnish, with the black hinges – very nice! In more well-to-do town houses, you’ll find some pretty ornamentation, both in the surrounding stonework, and on the doors themselves. Even tiny Vrboska has some quite posh examples, although this house has been empty for some time, and is sadly in need of some love and attention. Sometimes, the doorway includes a small window to one side. This seems to be particularly for commercial properties, so this little waterfront door could have been a shop at one time. Now here’s a lovely little shop door with a pretty red awning in Stari Grad. 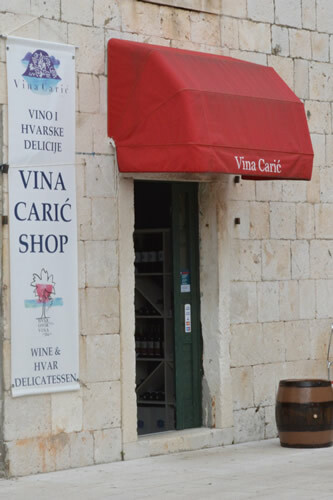 It’s the Vina Carić wine shop, a great place to stock up with wines and gourmet goodies! 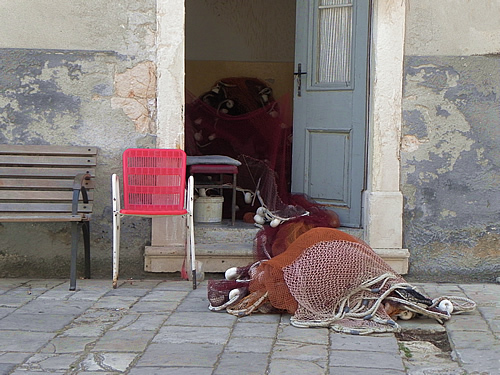 Also in Stari Grad, we have this doorway with piles of fishing nets on the steps. The blue-grey of the door is characteristic of town houses, as opposed to the more earthy colours on the rural houses. 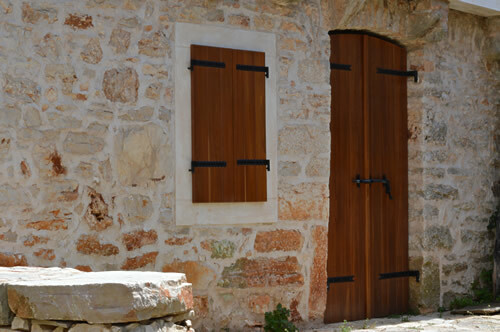 In Hvar town, the houses and the doors get seriously more impressive! This wonderful door used to look out onto the harbour, but the building has since been renovated, and it really has lost a bit of the old character. Shame! Meanwhile, another impressive green door, this time on the Jelsa waterfront, is beautifully maintained. 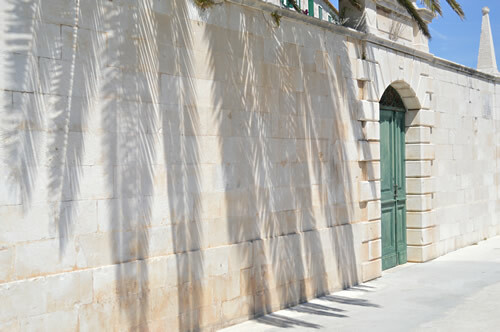 I love the shadows of the palm fronds on the wall. Beautiful doors and walls are not always as old as they appear. This wall is, in fact, brand new, as is the door. It’s also an example of a special type of door/gate. 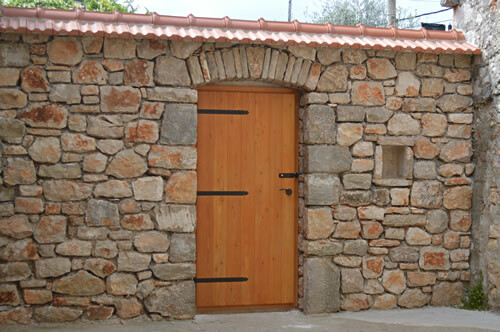 In Dalmatia, a portun (that’s pronounced por-toon) is a solid wooden door, usually at the boundary of a property – say the entrance to a konoba, or in the wall to the street. Something that you really feel ought to have a big iron key to lock it! 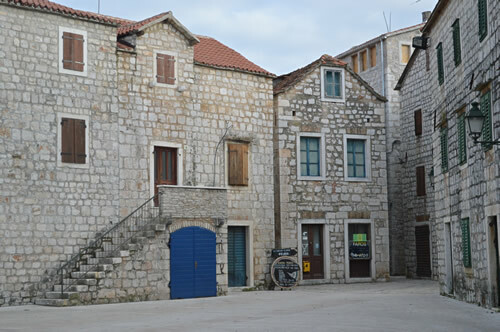 Doors in Stari Grad – with a blue portun! And Croatian has other words for a door. 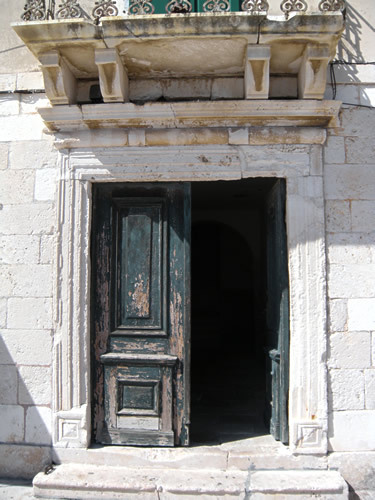 In northern Croatia, veža may be used for a doorway with a vestibule or lobby and the front door may be called a haustor, after the German/Austrian influence. And a large door into the street may be a kapija, from the Turkish kapi. 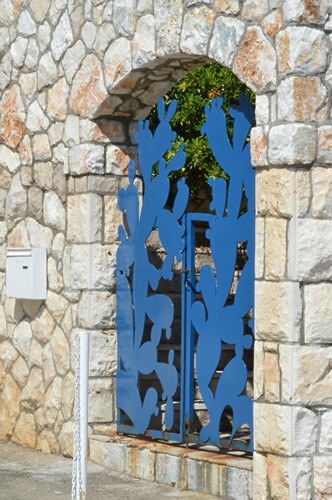 Vrata, of course, may also refer to a garden gate – the above example is the particularly lovely artistic gate into the Villa Meneghello in Hvar. It matches other sculptures in the garden itself. And moving further upscale, defensive city gates are also vrata. 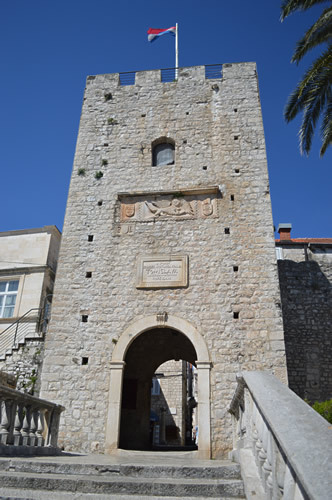 This one is the city gate into Korčula old town – notice the Venetian lion above the portal.